It's been eight weeks since we started on the foundations. We're still in a race against the weather. I wrote in an earlier post that we had built several of the components last summer at the shop, working on our concept of partial pre-fab housing. Khyber and Austin fabricated the vierendeel trusses that serve as the wrap around clerestories, and Rigo and Edward built the roof. 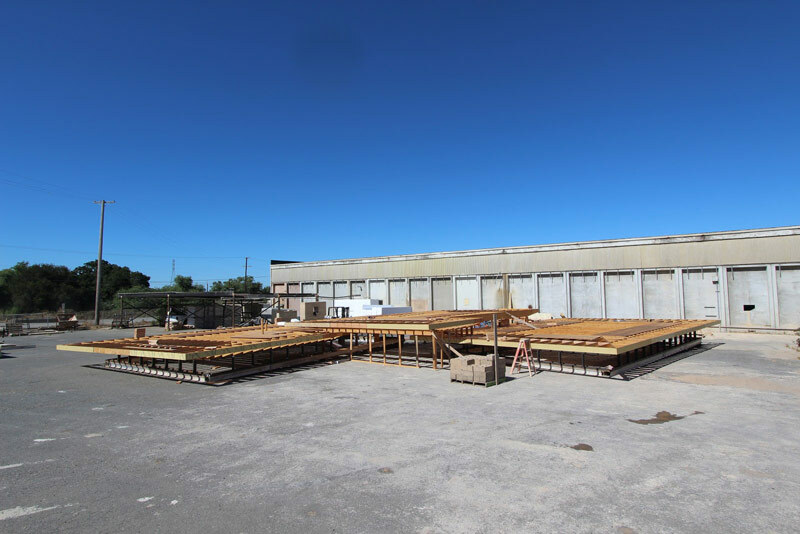 Here are two photos from last summer: the clerestory frames and the three roof panels under construction. This week at the job we had the chance to see if the trusses and roof panels fit the block walls built to support them. 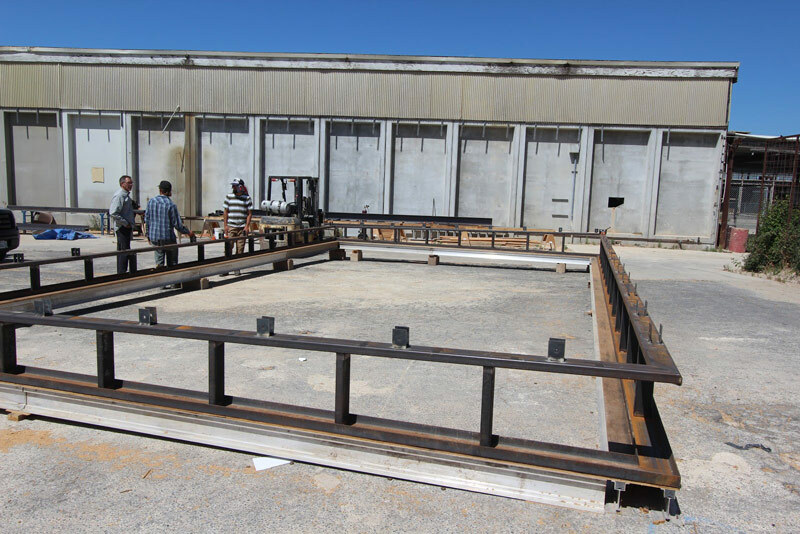 On Monday we set the trusses, and Khyber welded the corners and installed the last posts. The masons kept busy laying blocks on the bedroom wing, so by Wednesday we were ready to pour the final three feet of grout into the blocks in the kitchen wing and the second lift in the bedroom. 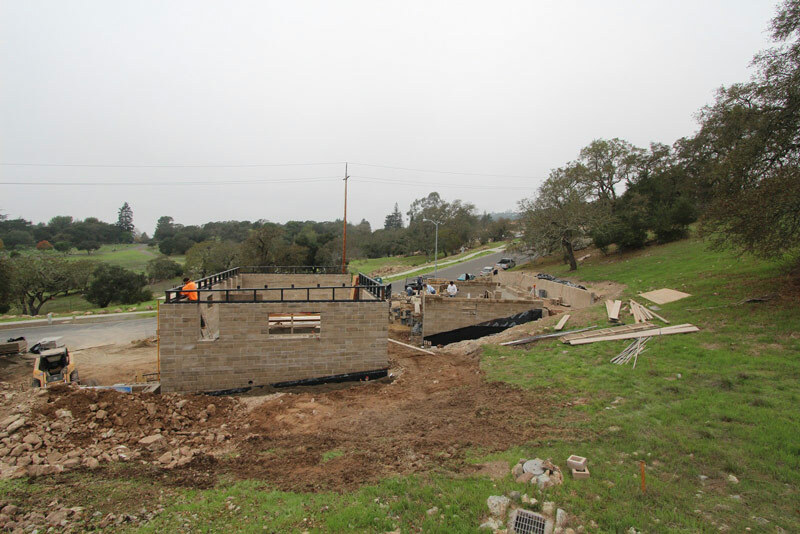 Here are some photos: setting the first of the clerestory trusses, all of them in place, the masons working on the bedroom, and one of Edward, Rigo, and Gabriel pouring the grout. We built a wooden funnel to get the grout into the narrow slot between the trusses and the blocks without too much spillage. On Thursday we loaded the first bundle of roof panels onto the truck and brought them to the job. I had thought we could pick up all five of them (1200 square feet total) with a chain sling, but that didn't work, so we requisitioned a second forklift, picked up the bundle from two sides, and backed the truck under them. By 9:30 we were at the job, unloading panels one at a time and setting them in the street for the crane to pick. Cindy Beckwith arrived at 10:00 with her new 100' crane and had her outriggers cribbed up by 11:00. We started putting on panels just as the rain began. Lucky for all of us, the panels fit onto the tabs just as we had planned, and the whole operation was wrapped up by 1:00. Here are a couple photos: Notice the masons in the background laying blocks on the bedroom wing while the crane set roof panels. With the roof panels on volume A, we were free to concentrate on getting to the top of volume C. The masons had been laying blocks all week, but we needed to get the beam and pan deck on so they could finish the second story blocks. Here are a couple photos of that part of the work: setting pan deck panels and then a finished shot with all of them in place, except where the staircase goes. I calculate we need to lay three courses of block each day in order to make it to the top in time to get this section roofed by the end of the month.